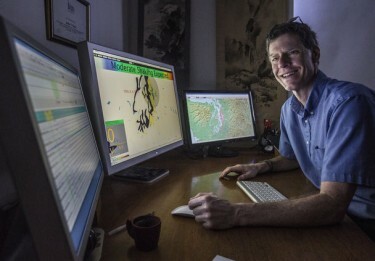 Pacific Northwest Seismic Network director and professor of Earth & Space Sciences at the UW, John Vidale works on the development of an early earthquake warning system. A recent article published by The New Yorker has resulted in widespread talks and panic about the risk of a mega-earthquake off the Pacific Northwest coast. While the seismic hazard is real, the article’s tone may have been overly fatalistic and didn’t highlight earthquake preparedness tools that are now being developed. The U.S. Geological Survey announced today that $5 million will go to the University of Washington and three other institutions to help transition the ShakeAlert earthquake early warning system to a public-facing tool. The new award provides funds to the UW, University of Oregon, University of California, Berkeley, and the California Institute of Technology to help develop a coast-wide system that would detect the first tremors and alert people, seconds or minutes in advance, of incoming ground shaking.